A single BetaProbe, TI or TI+, high precision digital thermometer can replace many liquid-in-glass (l-i-g) thermometers. It can also serve as a reference standard for other types of digital or analog temperature indicators. Plus, intrinsically safe certification means it can be used virtually anywhere. 650.006.3116 BetaProbe TI+ high precision digital thermometer, -50 to 300 °C (-58/572 °F), 3/16 x 18″ stem, Intrinsically safe (ATEX compliant) 0.001 resolution, +/- 0.06 °C Accuracy. Supplied with an ISO/IEC 17025 accredited, NIST traceable certificate of calibration report @ -40, 0.01, 100, 200, 300 °C and storage case. 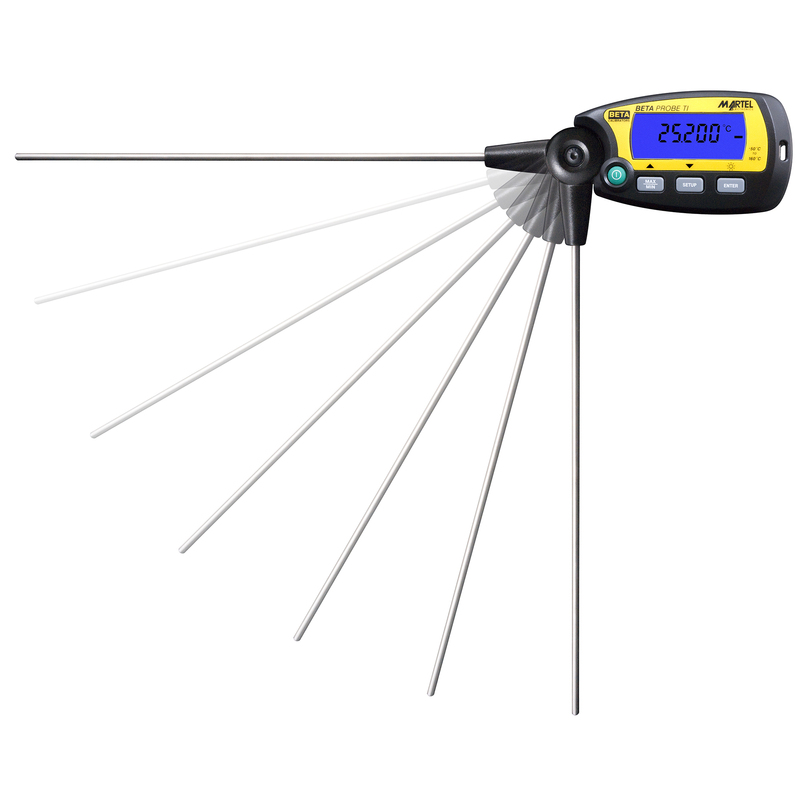 650.006.3213 The BetaProbe TI+ high precision digital thermometer, -50 to 300 °C (-58/57 °F), 3/16 x 18″ stem, Intrinsically safe (ATEX compliant) 0.001 resolution, +/- 0.06 °C Accuracy. Supplied with an ISO/IEC 17025 accredited, NIST traceable certificate of calibration report @ -40, 32, 212, 392, 572 °F and storage case. 650.005.3110 BetaProbe TI high precision digital thermometer, -50 to 160 °C (-58/320 °F), 3/16 x 12″ stem, Intrinsically safe (ATEX compliant) 0.001 resolution, +/- 0.06 °C Accuracy. Supplied with an ISO/IEC 17025 accredited, NIST traceable certificate of calibration report @ -20, 0.01, 50, 100, 150 °C and storage case. 650.005.3210 The BetaProbe TI high precision digital thermometer, -50 to 160 °C (-58/320 °F), 3/16 x 12″ stem, Intrinsically safe (ATEX compliant) 0.001 resolution, +/- 0.06 °C Accuracy. Supplied with an ISO/IEC 17025 accredited, NIST traceable certificate of calibration report @ -4, 32, 110, 212, 302 °F and storage case. 650.007.3110 BetaProbe TI high precision digital thermometer, -50 to 160 °C (-58/320 °F), 3/16 x 18″ stem, Intrinsically safe (ATEX compliant) 0.001 resolution, +/- 0.06 °C Accuracy. Supplied with an ISO/IEC 17025 accredited, NIST traceable certificate of calibration report @ -20, 0.01, 50, 100, 150 °C and storage case. 650.007.3210 The BetaProbe TI high precision digital thermometer, -50 to 160 °C (-58/320 °F), 3/16 x 18″ stem, Intrinsically safe (ATEX compliant) 0.001 resolution, +/- 0.06 °C Accuracy. Supplied with an ISO/IEC 17025 accredited, NIST traceable certificate of calibration report @ -4, 32, 110, 212, 302 °F and storage case.